When I made Coconut Rice Cups with Tricolor theme last week, I was so moved with feelings of patriotism that I made my breakfast bread with same spirits. Three color bread.... but wait!! 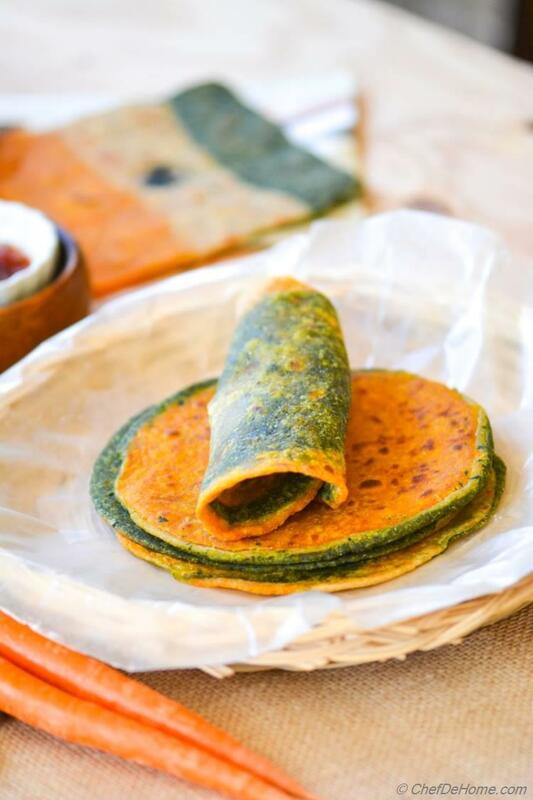 it isn't just a tri-color bread, it offers bounty of nutrition and can be great for healthy and wholesome start of the day. And it is Vegan!! Bonus!! 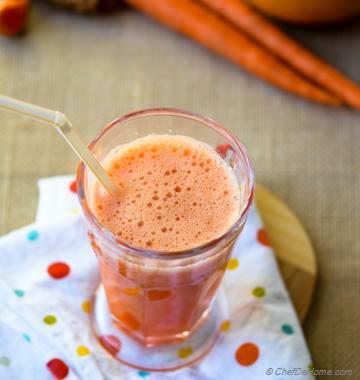 Kids will love and will not know that it has hidden secret gem of Beta Carotene from Carrots and Calcium from Kale + wholesome whole grains. 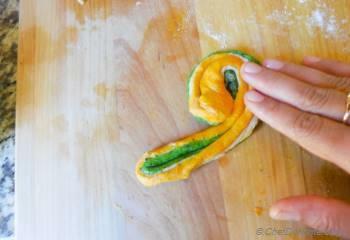 Making of this bread was really fun and adventurous for me. 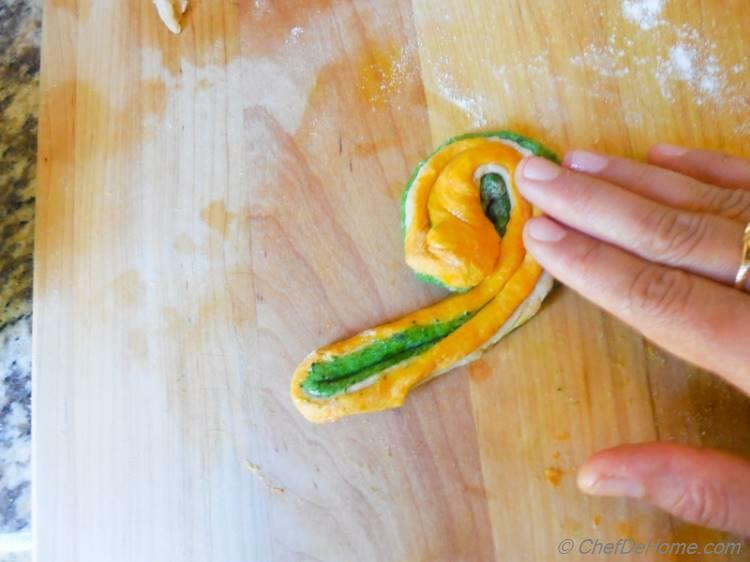 I made the dough keeping tri-color Indian Independent Day and Indian Flag in mind but certainly I was not sure what shape/design I wanna try with it. Then I decided to start with a simple bread and take my next inspiration from there... This time, I did good. 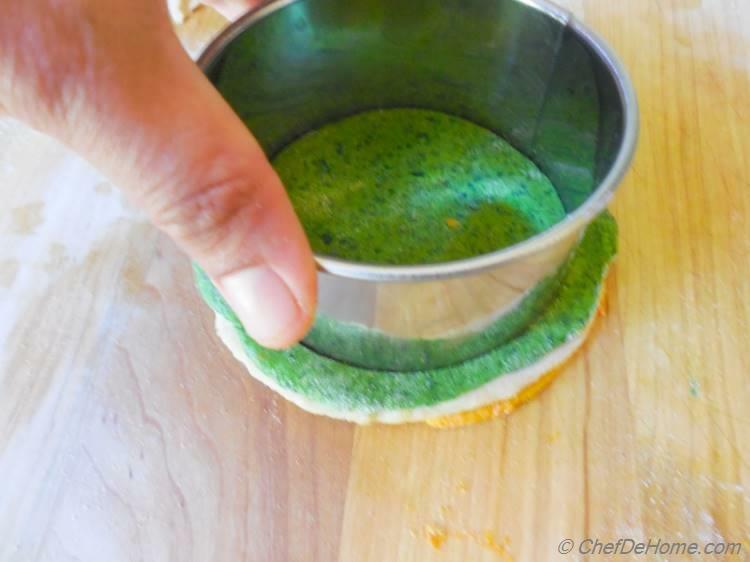 I made three layered, simple bread with white dough embedded in the green and orange layers. I did not throw away the trimmings remained after cutting the round flat bread. 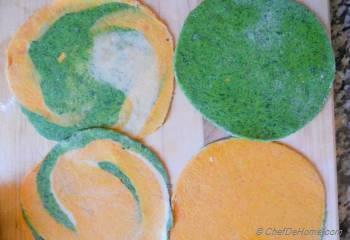 I used those trimmings with some oil to make tri-color spiral, then dredged it in dry flour and rolled a bit to make a spiral flat bread. Now, this one was awesome. 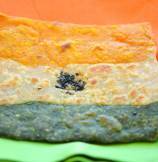 And then I couldn't resist rolling one just like Indian Flag. 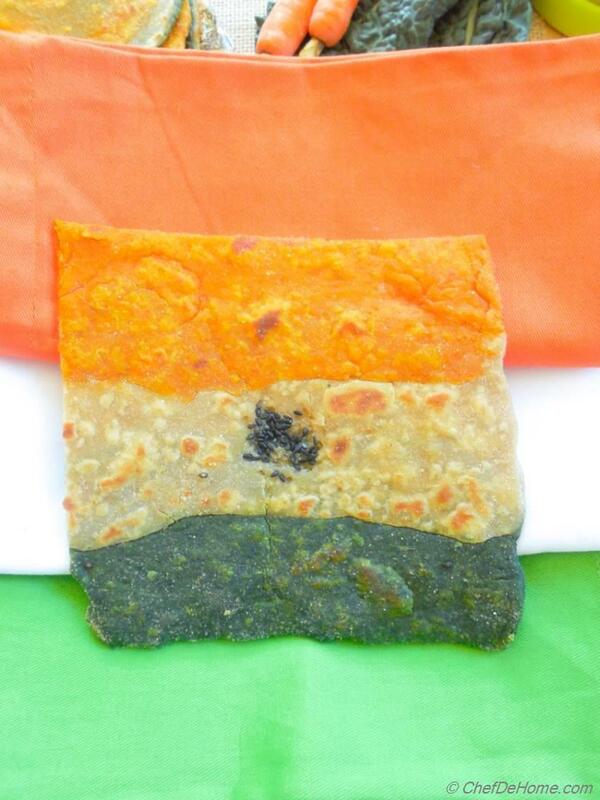 I will not be able to eat this one though out of love for Indian Flag. This bread made me so emotional. Felt and remembered sacrifice and courage of everyone who made us lucky to see our country independent after 100 years of slavery... touchy subject, lets not go there any further... lets get back to our nutrition rich carrot and kale bread! I don't have kids but I think such creative ideas can also help you teach kids about where they came from. No matter if its three colors of Indian Flag or American Flag, fun projects at home can help kids develop close connection with their heritage. I am certain, not just kids but everyone else will also love taste and texture of this bread. Ask me!! My picky eater (Vishal :) ), who does not like Kale or Carrots cooked anyways, loved this bread. His special mentions was for Kale Part because cooked kale bread had a distinctive hearty aroma and delicious taste. Carrot bread on the other hand was slight sweet and mild in flavor. Both of the dough are self-sufficient. 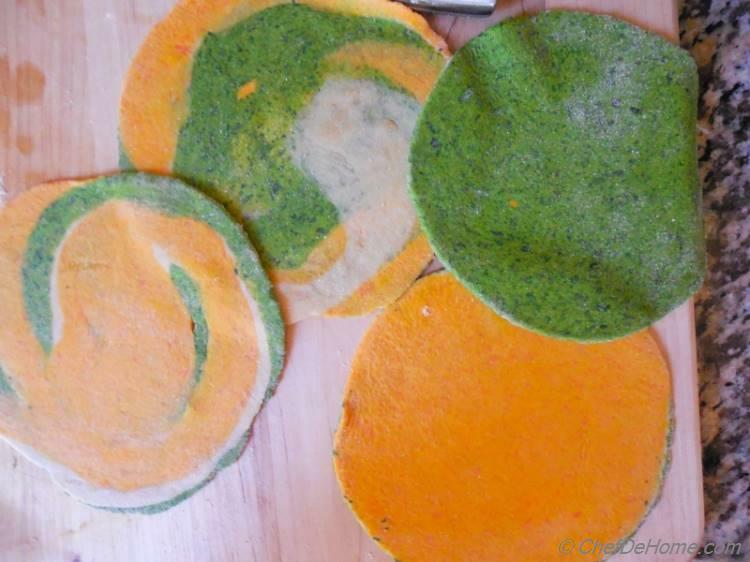 You can make just carrot dough or just kale dough. 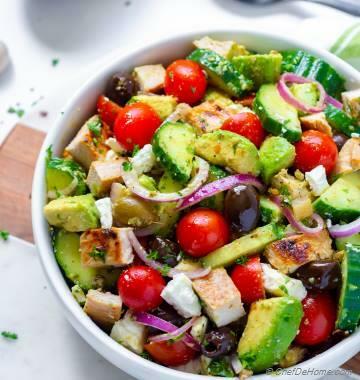 In-fact try different green veggies. Like spinach is my personal favorite. 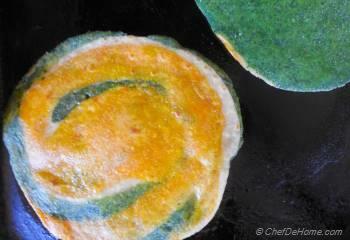 I make spinach flat bread very often and Kale bread was inspired from that. Both dough stay good in refrigerator for 2 days in airtight container then will start to get black. so make less dough or use it quickly or follow my standard rule. Roll and eat half and rest freeze to eat during the weekdays. 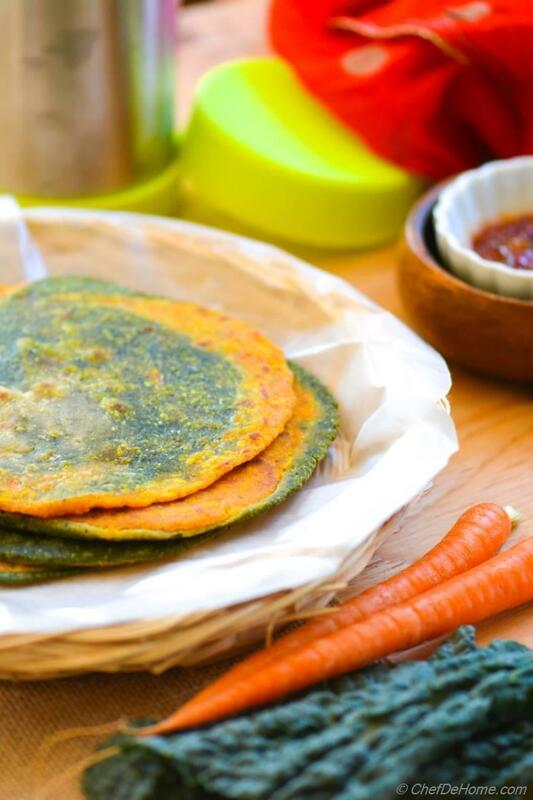 Whole grain flour, carrots, kale in one breakfast bread! And that too ready and frozen, just heat and eat! What else do we need? NOTE: If you cannot find Kale, use any dark leafy greens. Like Spinach, Mustard, Fenugreek are my personal favorites. 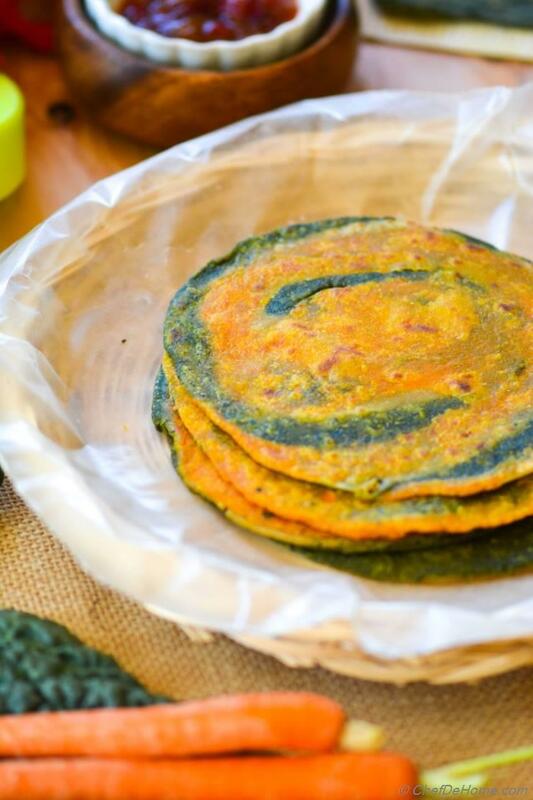 All are healthy, full of nutrients and have rich deep green color. 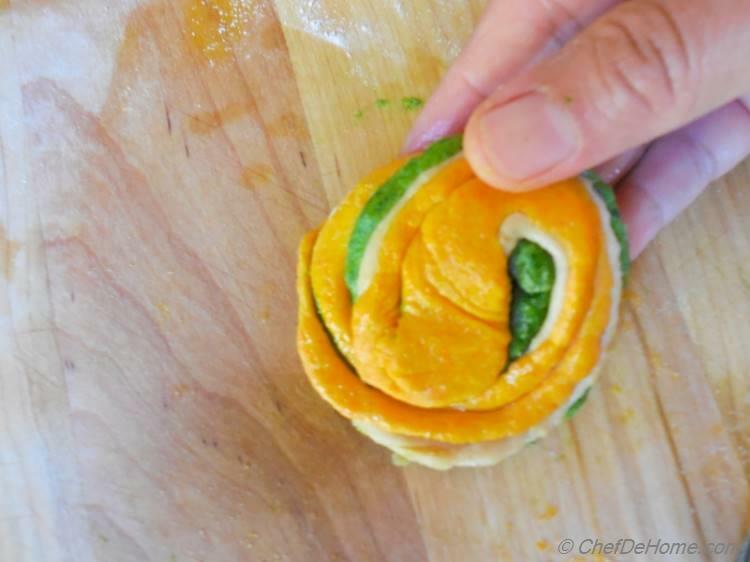 Smart Swap You can also make only Kale or only carrot bread to save sometime. 1. Bring a pot of water to rolling boil. Also ready a bowl of water with ice. 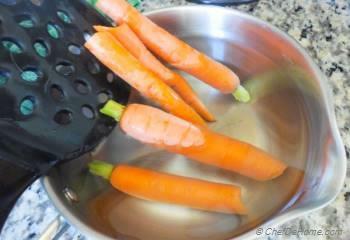 Blanch carrot in boiling water for 3 minutes, then remove into cold water. 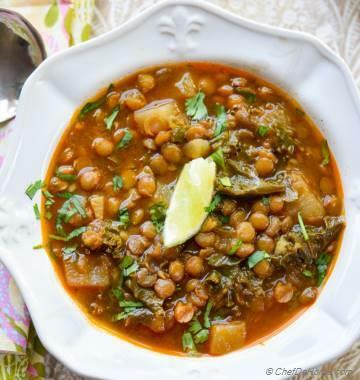 While carrots are cooling down, add kale (discard stems) or spinach (if using) into pot and cook for 3 minutes. Remove kale into cold water to stop the cooking. 2. 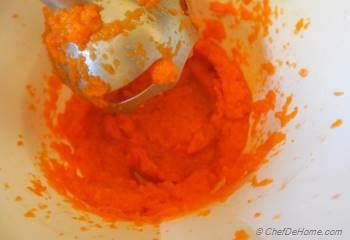 Using hand blender or food processor, grind carrots with 3 tbsp water to make puree. Transfer to a medium size bowl. 3. 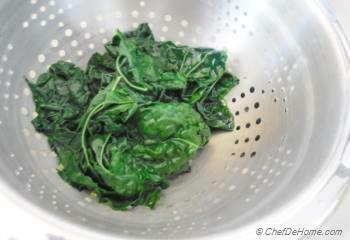 Also grind kale, squeeze excess water from kale (or spinach) then blend to make puree, use 2-3 tbsp water if help in grinding. Transfer to an another bowl. 4. 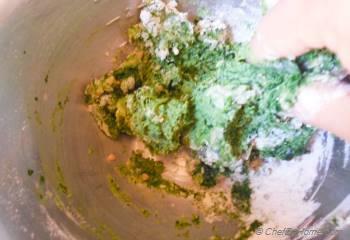 Kale Dough - Add mentioned 1 tbsp canola oil, salt and wheat flour to bowl with kale puree and knead to make soft dough. add 1-2 tbsp flour if dough is very sticky. 5. 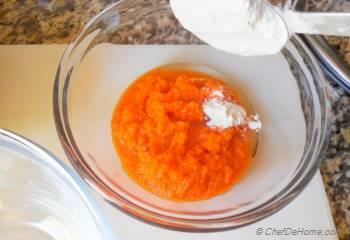 Carrot Dough - Add mentioned 1 tbsp canola oil, salt and wheat flour to bowl with carrot puree and knead to make soft dough. add 1-2 tbsp flour if dough is very sticky. Also knead the plain dough in third bowl with ingredients given in plain dough ingredient list. 6. 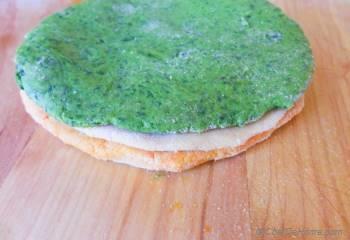 Roll Flat Bread - Dust a board with dry wheat flour. Make small three balls, one of each dough. 7. Roll balls to make 2 inch small circles. Layer three circles on top of each other. I layered orange-plain-green. 8. 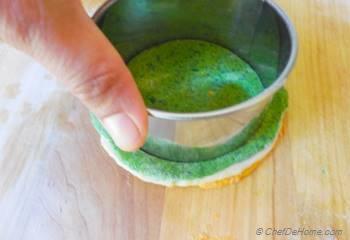 I used cookie cutter (a small round bowl works totally fine) to make even edges of layered circle. 9. 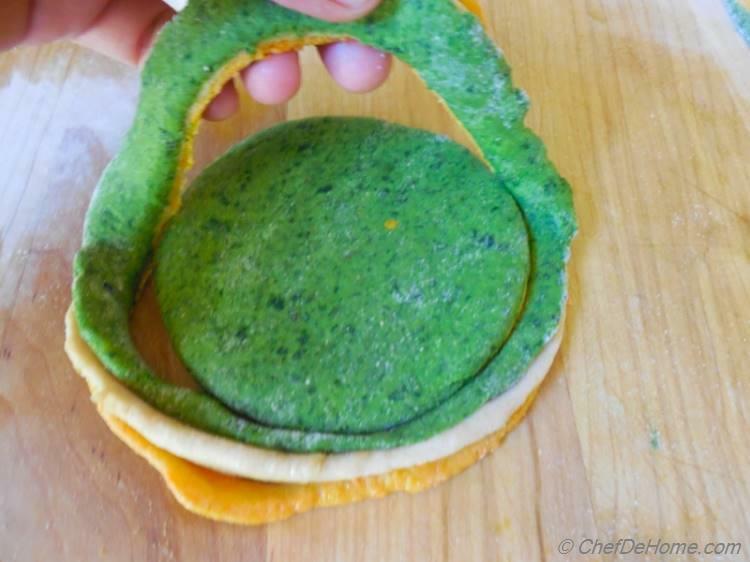 I en-circled the trimmed edges to make a multi-colored ribbon ball and then rolled it to make another shape or three colored flat bread. 10. 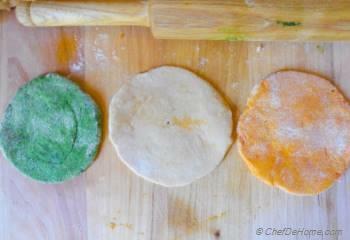 Using roller pin, roll the even layered dough to 6-8 inch round flat bread. 11. Heat an iron skillet and sear the rolled flat bread on each side for about 2 minutes or until brown spots appear here and there. 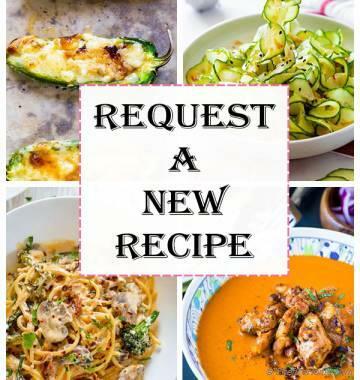 I applied 1/2 tsp oil on each side while searing for better taste and slight crispy texture, but that is totally optional. 12. Repeat the 6-10 steps to make all flat bread. 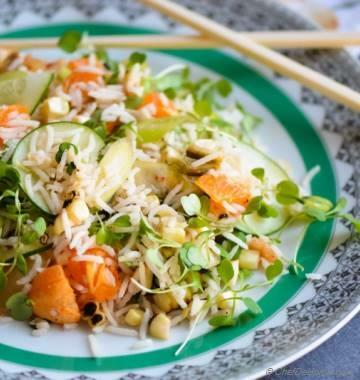 Serve with salted butter or chutney or jam. You can also serve these bread on the side with soup or stew. Also, these healthy and nutritious bread are great for picnic or hiking. Just apply a thin layer of butter, or roll around a thin cheese/turkey slice, eat as you go!! While making Plain Dough, start with less water, then add gradually so that dough is neither too firm nor too loose. If making less number of flat breads, keep the rest of dough refrigerated in tight-lid container. Dough will stay good for 2-3 days. 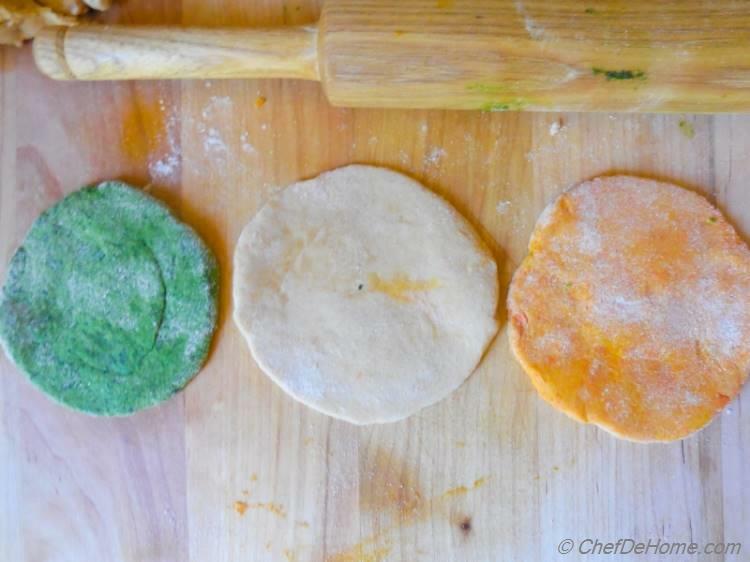 You can also roll the extra dough to make remaining flat breads. Don't cook it. 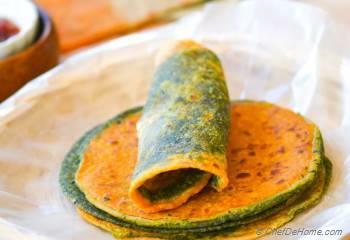 Just stack uncooked, rolled dough with a parchment or cling-wrap sheet in-between. Stick to freezer. Take bread out and directly sear on hot flat skillet to enjoy fresh breads anytime you want!